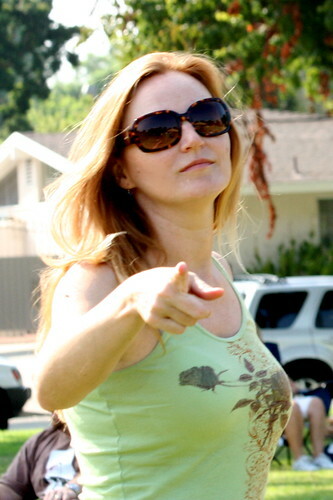 Don’t you point that camera at me, young man!, originally uploaded by Temeculamom. I rarely post photos of myself, but, I’ve gotten three compliments on this one so far, and I didn’t even know anyone would see it. I’ve decided it makes me look thinner and younger, so I like it just fine. But at the time I was definitely trying to avoid the camera. I prefer remaining on the other side of the lens. How about you? I would love to see some photos of my online friends. Some of you are very bold about it and share them often (thank you! ), but some of you I don’t get to “see” very often. Come on, pick one you like (or hand someone else a camera) and share with us. Please? ~ by bekaboo on September 16, 2008. You’ll have to wade through some whining first (about the finger), but you didn’t really expect this to come without a pricetag, right? I’ve posted a few pics of me on my blog. I will do some more very soon, as I am only a pound away from my goal weight and it will soon be time for some “before” and “after” comparisons! Hey great photo, even the pointy finger makes you look cool. Well I have posted a photo of me on Sunday and one the week before and they are recent. I am back in the front of the camera, I was missing in action for a while but now I am back. You are very pretty indeed, quite striking actually.